It’s good to know some of the diagnostic terms used by medical personnel. Understanding their meanings can help in any discussions or questions you may want to bring up. A neuron is a nerve cell. Nerve cells are the building blocks of the brain and the nervous system. Neurons are damaged by Alzheimer’s disease, causing the brain to lose mass. Neurology is the study of the brain and the nervous system, and diseases related to them. A neurologist is a physician specializing in neurology. Geriatrics is the field of medicine that studies, cares for and treats older people. A Geriatrician is a physician specializing in geriatric medicine. A symptom is any phenomenon that is experienced by someone and serves as evidence that there is a condition or a disease. With Alzheimer’s disease and related dementias, most symptoms are behavioural; we know that something is wrong because the person is behaving differently than usual. A syndrome is a group of symptoms that are typically present with a disease or condition. Dementia is a syndrome, a cluster of behavioural symptoms that are typically present when a person experiences cognitive impairment. The etiology of something is its cause. One possible cause (etiology) of dementia (a syndrome, or cluster of symptoms), is Alzheimer’s disease. Cognition refers to the thinking processes of the brain. It includes memory, perception, planning, problem-solving, reasoning and decision-making, managing emotions, learning, understanding and communicating, awareness and insight and more. Degeneration is a progressive loss of function. The prefix “neuro” refers to the brain and nervous system tissue. So, neurodegeneration is a progressive loss of functioning in the brain or nervous system. Alzheimer’s disease is a neurodegenerative disease. When doctors talk to you about the diagnosis and symptoms, they may refer to different structures in the brain. Having a basic map of the brain and an elementary understanding about what each part is responsible for can help you to communicate with medical professionals. Having an idea which parts of the brain are affected can also help caregivers better understand and manage their loved-one’s behaviour. A caution: while this section aims to provide you with a basic “map” of the brain, be aware that the brain is an intricately complex organ. This section is intended to provide a layman’s reference and it is and intentionally drastically simplified conception of how the brain works. 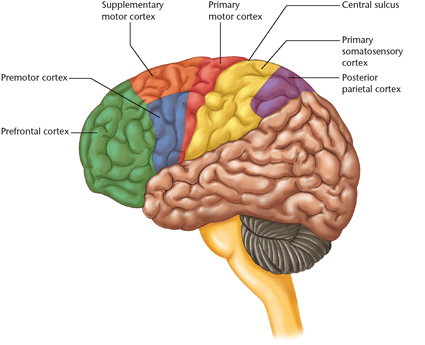 The outside part of the brain is called the cortex or the cerebrum. This is the wormy-looking “grey matter” of the brain, and the largest part. It is divided into two halves or hemispheres (the right brain and the left brain) and each half is divided into four lobes; the frontal lobe, temporal lobe, parietal lobe and occipital lobe. The cortex is responsible for the voluntary processes of the brain, things like action and thinking. Frontal lobe responsibilities include reasoning, planning, problem-solving, abstract thinking, reasoning, parts of speech, movement, and emotions. Temporal lobe responsibilities include memory and processing sounds. The parietal lobe is associated with touch, pain and temperature. The occipital lobe is associated with vision. The cerebellum is a “little brain” located under and behind the cerebrum. It’s responsible for regulating the body, coordination and movement, posture and balance. The limbic system, referred to as the “emotional brain” is deep inside the brain and includes four structures: the thalamus, hypothalamus, amygdala, and hippocampus. The thalamus helps control attention span and it monitors sensations the body is feeling, including pain. The hypothalamus controls mood, hunger, thirst, and body temperature. The amygdala controls our bodily response to emotions (especially fear) and to memories. The hippocampus is involved in converting working memory to long term memory. It is also associated with our ability to understand and remember spatial relationships. The brain stem is responsible for basic bodily functions like heartbeat, blood pressure and breathing. Short term memory (STM) is your memory of things that happened recently. Typically, STM is profoundly impaired in Alzheimer’s disease. Long term memory (LTM) is your memory of things that happened a long time ago. Unlike short-term memory, LTM typically remains reasonably intact for someone experiencing Alzheimer’s disease. Working memory, a type of short term memory, is used to help us stay “on track” in a task. Alzheimer’s affects working memory, so that someone experiencing Alzheimer’s disease might get “lost” in a task, needing a caregiver to support and cue them throughout the process. Episodic memory is your memory of particular events and experiences. Typically, Alzheimer’s disease affects the brain’s ability to store new episodic memories. Procedural memory is sometimes called motor memory or motor skills. It is a type of long term memory that helps us to store information on how to do something (without necessarily remembering how we learned the thing). Procedural memory is typically reasonably intact for people experiencing Alzheimer’s disease. Semantic memory, a type of long-term memory, is our knowledge of concepts, ideas, and facts (eg. The names of colours or sounds of letters). Alzheimer’s disease impairs semantic memory for some people, but for others it can remain relatively intact. Aphasia is a loss of speech and of understanding language, resulting from brain damage. Apraxia, which is caused by brain damage, makes it difficult for a person to control his body, making purposeful motor movement difficult. A person experiencing apraxia might want to stand, but be unable to control his body to do so. Anxiety is characterized by fear, nervousness, and agitation. Individuals with Alzheimer’s commonly feel anxiety, in large part because short term memory loss means that the person’s expectations and reality are not matching up. When this happens, the person is likely to feel anxious. Depression is a mood disorder characterized by sadness and loss of interest. Apathy is a loss of interest in engaging in activities. It differs from depression because does not include sadness or emotional discomfort. Mobility is a person’s ability to move freely and fluidly. Fine motor skills are small movements that use the small muscles in our bodies – fingers, lips, jaw, etc. Gross motor skills are large movements that use big muscles like those in our arms and legs. Abstract thinking is our ability to imagine a state we are not experiencing right now. Concrete thinking is an inability to do so. This is a term used frequently by social workers, occupational therapists, and other professionals who assess a person’s ability to maintain a good quality of life autonomously. Professionals who evaluate how much help a person requires on a day to day basis will observe that person’s ability to perform activities of daily living (ADL’s), those things that we need to take care of on a daily basis to be healthy and safe. ADL’s are sometimes broken into two categories: basic ADL’s and instrumental ADL’s. Basic ADL’s include bathing, dressing, self-feeding, personal hygiene and grooming, toileting, and functional mobility (the ability to get in and out of a bed or chair, and to navigate safely though space). Instrumental ADL’s are more complex processes, including housework, meal preparation, taking medication, managing money, shopping, transportation, taking care of others, and using the telephone. Dementia is a syndrome describing a number of symptoms that are present in diseases that affect the brain’s cognitive processing. Dementia is a descriptive term. It does not tell us what is causing the symptoms. Like dementia, cognitive loss is a descriptive term. It means that the brain has lost some of its previous ability to process, remember, and deal with information and emotions. Mild cognitive impairment (MCI) means that a person is experiencing some significant, but not extreme, cognitive loss. For some, is non-degenerative. For others, it marks the onset of symptoms of Alzheimer’s or a related dementia. Researchers are beginning to use biomarkers in order to determine whose MCI is likely to be a sign of early Alzheimer’s disease. The onset of a disease is when the person first manifests a symptom associated with the disease. Because Alzheimer’s has a “insidious onset” (the first symptoms are very, very subtle), most people have difficulty pinpointing exactly when the symptoms started, and many people realize after diagnosis that their symptoms started months or years before they were aware than anything was wrong. Prognosis is the amount of time a person is likely to live after they have been diagnosed with a disease. For people experiencing Alzheimer’s, the prognosis is highly variable, with some individuals living with the disease for decades. A disease is incurable when there is no “cure” – a medical treatment or therapy that makes it go away. While Alzheimer’s is incurable, there are treatments and therapies which can help to manage the symptoms of the disease and improve quality of life. A disease is called degenerative when it gets worse over time. Alzheimer’s is a degenerative disease. Doctors use mental status testing to determine whether a patient has cognitive decline that indicates the presence of dementia symptoms. These are question-and-answer tests (written or oral) that assess your brain’s ability to process and retain information at the time the test was given. A mental status test score may indicate to the doctor that there is a need for further testing because dementia symptoms are present. It does not tell the doctor what is causing those symptoms. The most common Mental Status tests are the Montreal Cognitive Assessment (MoCA) and the Mini-Mental State Exam (MMSE). Sometimes, medical professionals will describe a person’s symptoms in terms of stages. Doing so allows professionals to group people with similar levels of cognitive impairment together, and to develop treatment protocols accordingly. However, it’s important that caregivers understand that ascribing a stage to any individual is quite arbitrary. Because Alzheimer’s is a gradually degenerative disease, there is no discrete moment when a person passes from one stage to the next. Indeed, it is possible to manifest symptoms in multiple stages at the same time. When discussing stages with a doctor (or other professional), it’s important to first ask which model (or classification system) she is using. The two most common models describe Alzheimer’s as having three or seven stages. In the 3-stage model, stage 1 is “early” or “mild,” stage 2 is “moderate,” and stage 3 is “late” or “severe.” In the 7-stage model (the Global Deterioration Scale), the stages are labeled from stage 1 , which is normal functioning, through to stage 7, the severest level of impairment. In the 3-stage model, “stage 3” would describe someone with a lot of damage to their brain. In the 7-stage model, a person in “stage 3” has relatively little impairment, equivalent to stage 1 in the 3-stage model. Young (or Early) Onset Dementia or Alzheimer’s is diagnosed when the person first begins showing symptoms when they are younger than 65 years old. A younger person who has dementia can be in the early, moderate or late stages of the disease, so it’s important to note that “Early Onset” and “Early Stage” are not the same. For this reason, AGI prefers the less confusing term, Young Onset. Young Onset Dementia is quite rare and requires specialized care. If you or a loved-one has been diagnosed with a Young Onset Dementia, contact AGI to hear about the services we can offer which are tailored to your specific needs. Early stage means that the individual experiencing Alzheimer’s has relatively mild impairment. It should not be confused with Early (or Young) Onset which means the person was younger than 65 years old when they began manifesting symptoms. When a medical professional describes someone as having “atypical” dementia, it means it differs significantly from Alzheimer’s or a related dementia in some way. If this is the case for you, it’s okay to ask in what way the dementia differs from the norm. A diagnosis of “mixed dementia” means that the doctor has determined that more than one type of dementia is present at the same time. In this case, it’s a good idea to ask which dementias are present. Senility is an old-fashioned term that was used to describe an older person who was showing some kind of cognitive decline. The terms senile and senility are not medical terms, and it is not very specific. It has fallen out of use.